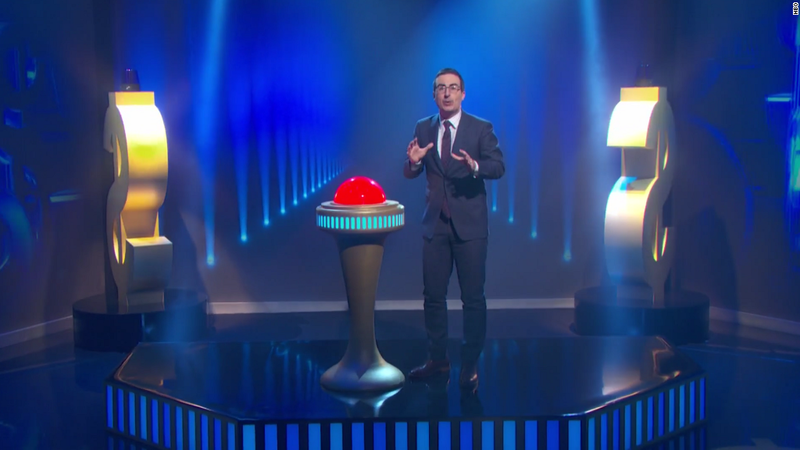 As part of a scathing takedown of the debt-purchasing industry, late night comedian John Oliver forgave nearly $15 million of medical debt with a tap of a giant red button on Sunday night. Oliver called the giveaway the "largest one-time giveaway in television history." He just about doubled the value of Oprah Winfrey's famous "You get a car! You get a car! Everybody gets a car!" giveaway to her entire studio audience in 2004. The segment included a hidden camera brought into a Debt Buyers Association conference by "Last Week Tonight" staffers, which showed panelists appearing to scoff at how Americans don't understand their legal rights about paying their debts. To further illustrate the lack of regulation and ease at which debt collectors can harass people over money they owe, Oliver said "Last Week Tonight" spent $50 to create its own debt collection agency, based in Mississippi. "Any idiot can get into it, and I can prove that to you, because I'm an idiot and I started a debt buying company and it was disturbingly easy," Oliver said. Oliver named the company "Central Asset Recovery Professionals," or CARP, "after a bottom-feeding fish." He appointed himself chairman of the board. After setting up a bare-bones website, Oliver said CARP was offered a portfolio of nearly $15 million in medical debt for just $60,000. "Last Week Tonight" was able to pay less than half a cent on the dollar for all that debt. Oliver said CARP could have received a file that included the names, personal addresses and Social Security numbers of nearly 9,000 people who owed the debt it had purchased. He called that fact "absolutely terrifying, because I could legally have CARP take possession of that debt and have employees start calling people turning their lives upside down over medical debt." "There would be absolutely nothing wrong with except for the fact that absolutely everything is wrong with that," Oliver continued. "We need much clearer rules and oversight." In the end, Oliver said "Last Week Tonight," decided to forgive all that debt -- not just because "it's the right thing to do," but also because it would trump Oprah's $8 million giveaway. With the tap of a giant red button, streams of confetti, dramatic music and strobe lights, Oliver transferred the file with the 9,000 debtors' personal information to RIP Medical Debt, a nonprofit that forgives medical debt with no tax consequences for the debtor. "It seems to me the least we can do for debt I cannot f---ing believe we're allowed to own is to give it away," Oliver said to close his show. "F--- you, Oprah. I am the new queen of daytime talk!"